A natural extension of this route is the couloir that shoots nearly straight down from Point 7088 for a bonus 3,000' of chute skiing. 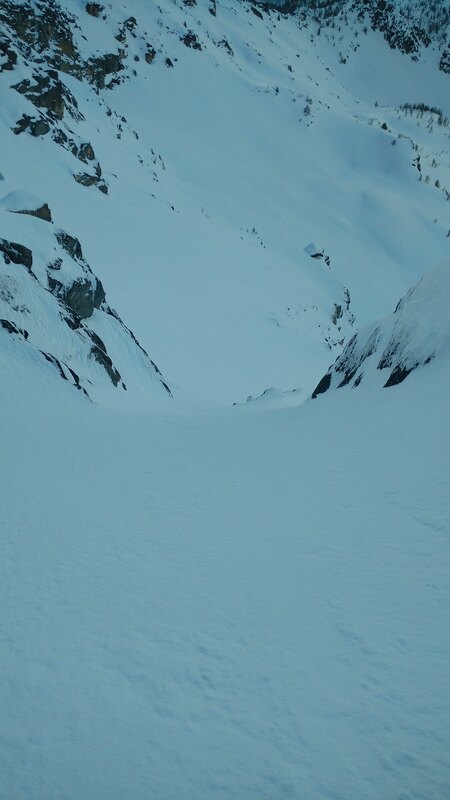 I know the locals have a name for it, but I can't remember what it is.� I called it the Heart of Darkness couloir because I by the time I started into it, 5:30pm, all light was gone.� I did know it had a rappel or two over ice, but wasn't sure where. I ended up doing two rappels off small trees.� �I've studied this shot for the past couple years too, and was excited by the prospect of linking up the two routes for a monster day. 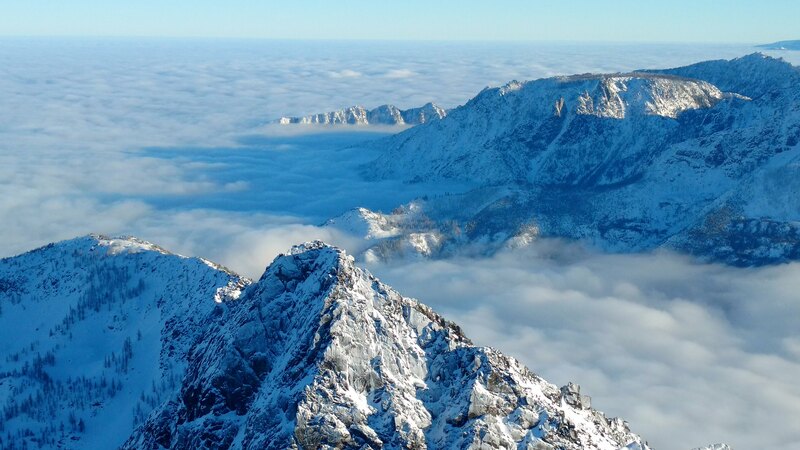 Here is an overview of the route.� Pt 7088 is the foreground, with the couloir cleaving straight down its middle. Up Pioneer Creek, at around 5,500 feet I finally broke out of the dreary inversion, greeted with warm, spring-like sun and jaw dropping views. The warm sun and temp made for pleasant travel, but the flip side was snow sticking to skins, alleviated somewhat by a chunk of skin wax for just such issues.� And finally, after 5 hours on the go, I found a goat companion who broke trail for me briefly. I made the summit by 3:00pm, a much quicker time than previously, as the booting was much better. 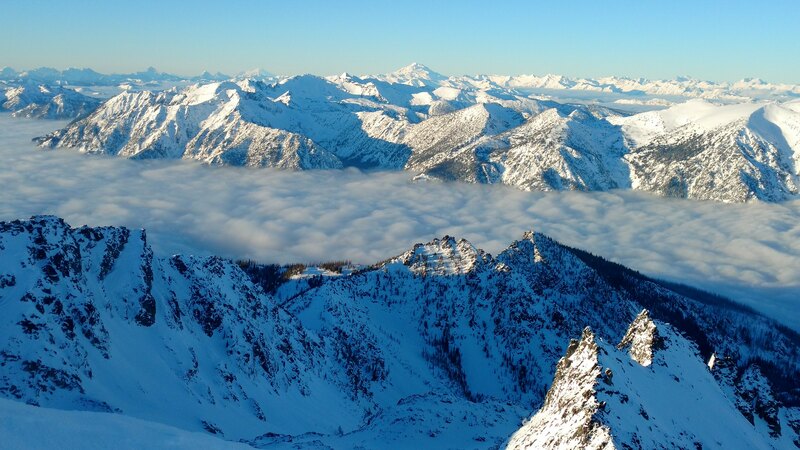 Spectacular views above the inversion persisted, in incredibly still and warm air. But on top I noticed I still had a very long way to go over to Pt 7088, nicely highlighted in sunlight.� The large pyramid shadow is Cashmere's summit. 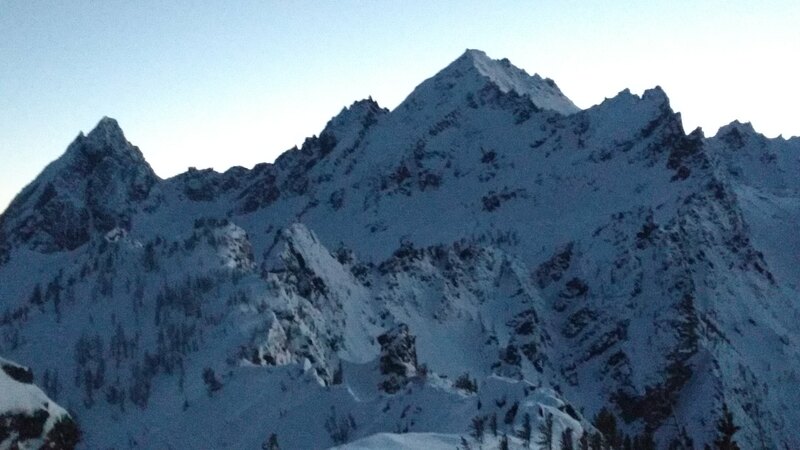 I clicked in just below the summit and skied over to the North Ridge, and was a bit alarmed that finally seeing it up close in person, it was quite steep with a couple do not screw up sections.� This was a bit lower down in the gully that emptied into the north basin. 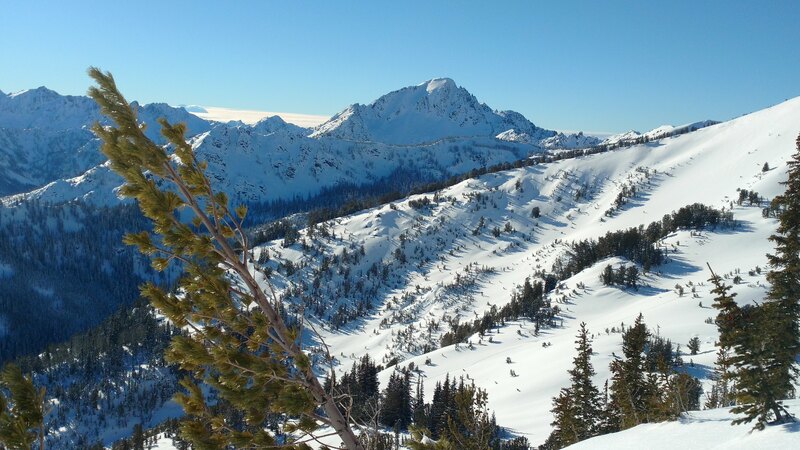 The steepest bits were crusty, making for some stressful turns, but the lower gully was fantastic powder skiing.� The snow in the north basin was nicely preserved powder too.� Here's a look back, grossly foreshortened. 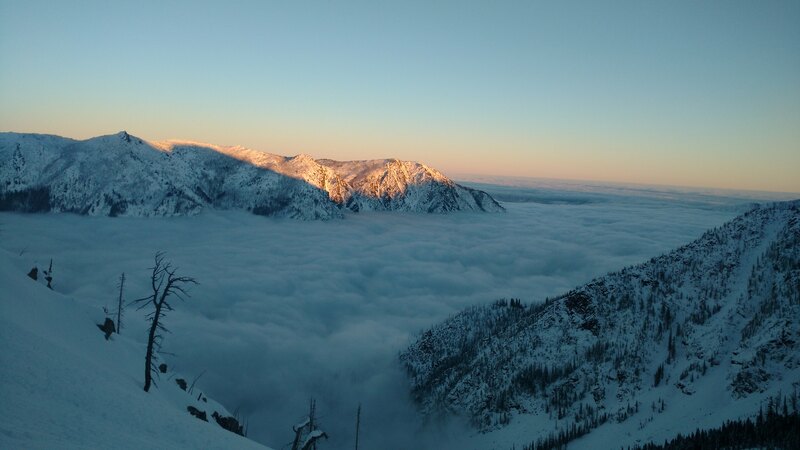 Looking back at the North Ridge of Cashmere. 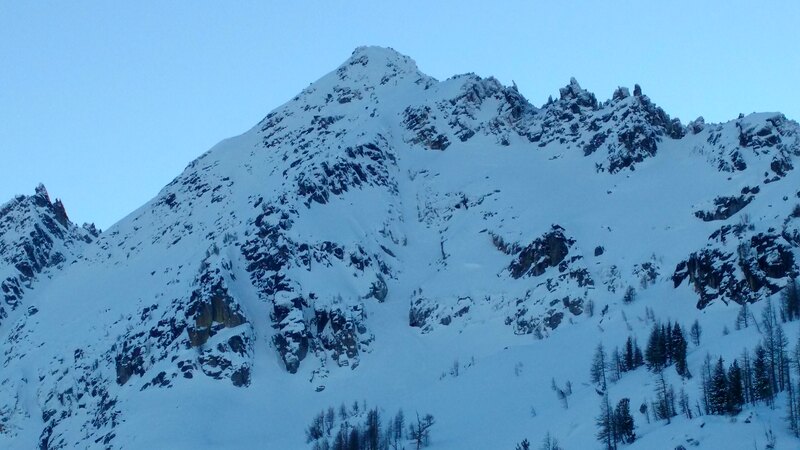 Unfortunately since it was dark I don't have photos of the 7088 couloir but it was great powder skiing at a consistent pitch.� I rapped twice (60m, 7mm cord) off nearby trees to overcome a couple ice bulges. 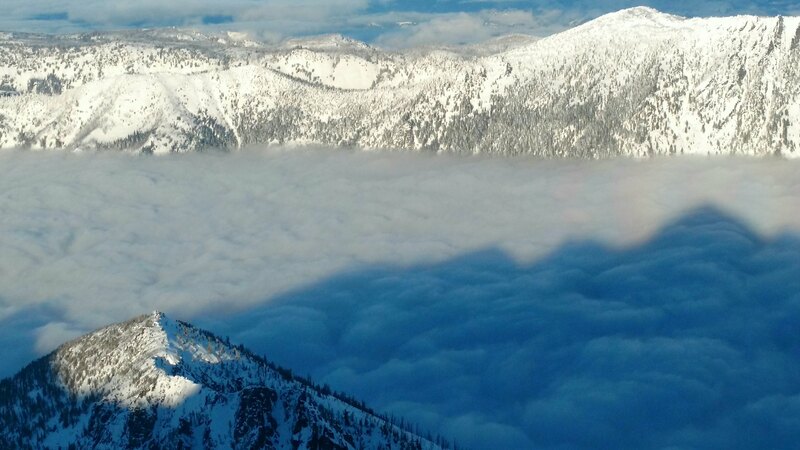 Upon exiting, I had planned to contour northwest over Victoria Creek and further until I was plum with the bridge over Icicle Creek.� This would ensure you respect the private property that is below. Reached Icicle road by 7:30pm and refeuled with some a hot Cup o Noodles and Tandoori Rice and stumbled the last 4 miles back to the car by 10:30pm. Nice work Jon! Intriguing lines. That northeast side of Cashmere rarely sees much ski traffic I dont think. Thanks Pete! Good skiing if you can stomach the approach. Another monster trip in the books! Multiple rapells usually let me out of a ski day! While you were on this trip I was skiing hippy dippy pow with 30 minute transitions! 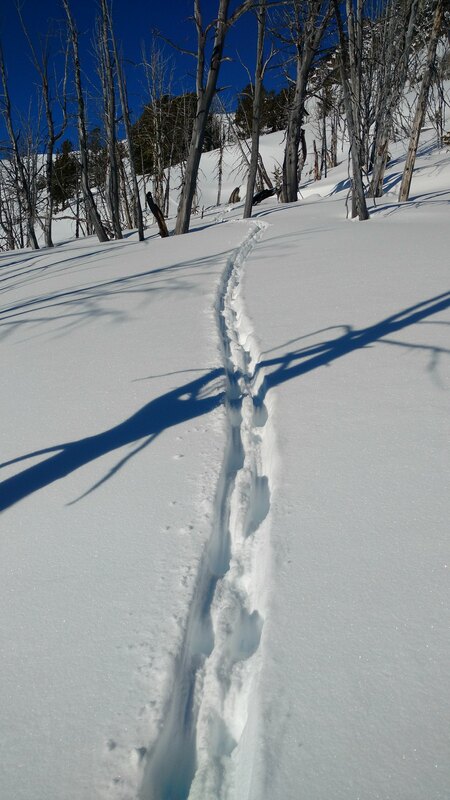 Seems like you have pretty well skied every side, great trip. Outrageous solo roaming John. I think you need a pet photographer, maybe the goat....? Thanks! You back in America now? If you're not a local I don't know who is. Call it whatever you like. Ay, I am back, but don't call, ha ha ha. Splitboard rapping sounds way too gangsta for me. Here's a good photo from Steph Abegg (duh!) 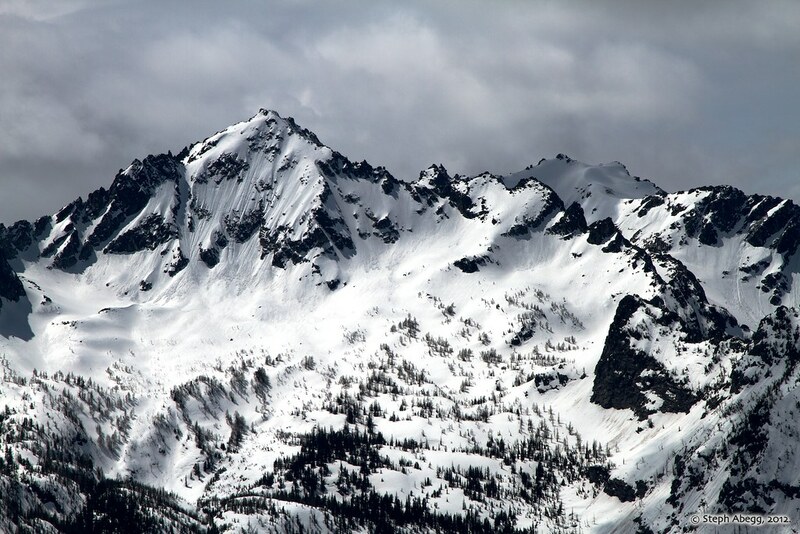 of Cashmere's N ridge in late spring conditions. 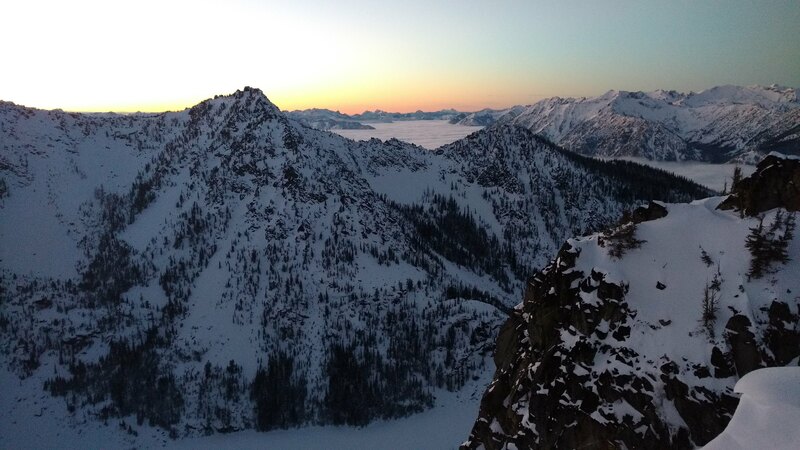 And a web pilfered photo of Point 7088, left couloir. Is this roughly where you went? How about the arrows with question marks? 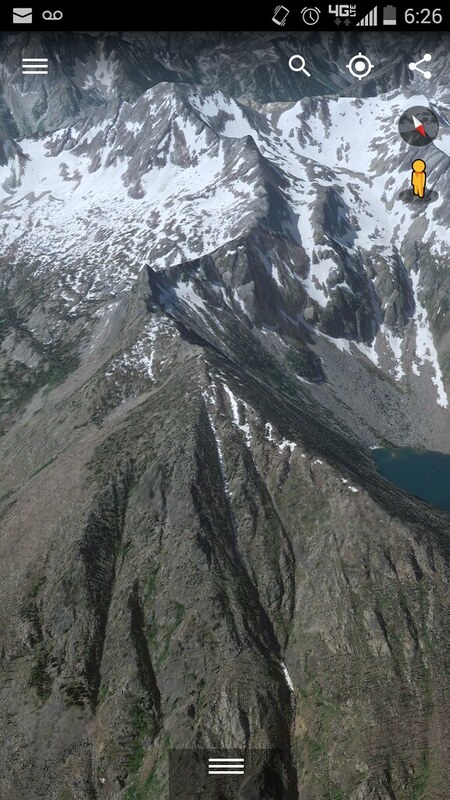 I take it that the Pt 7088 couloir is a previous locally known descent. Was wondering what sufferfest you might be working on given our good snow conditions here in Central WA. Now I know. As always, a great trip report. Yes, that's exactly where I went, then the lower question mark around the front of that rock buttress, then a climb up to the ridge crest. I've heard the 7088 couloir had been skied. Not sure who but had heard there was a rappel or two so I came prepared. I was told the name of the couloir a couple years ago, but can't recall. Thanks Andy! I heard you and gang were mining Entiat goods. I look forward to the TR! Way to give the mountains all your daylight and then some. Sweet! You finally got it done! Upper part looks nice, lower part sounds like type plotz fun. Was doctoria the name? Or is that just something else between doctor and Victoria creeks? Not sure where I heard that. You would have loved it Scott. Nice soft snow had one of the alder trees snapped on rappel. I think Dan Z used to call it the "Myspray Couloir"
Yeah "Doctoria" would be west of lake Victoria. 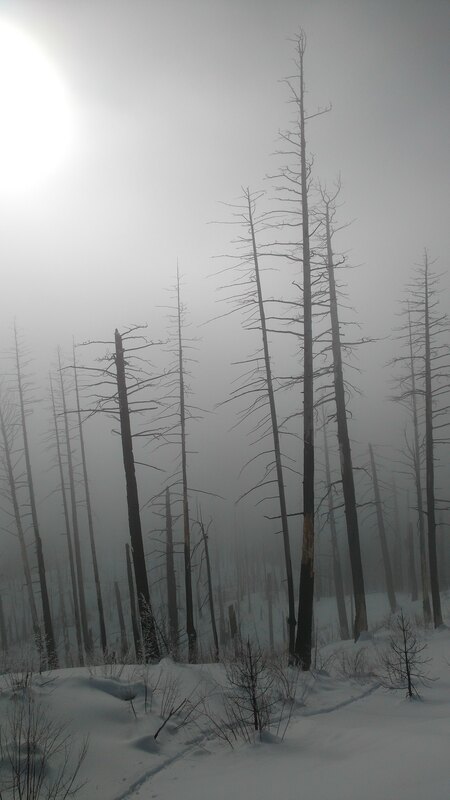 Great ski from NW face of Cashmere to Lake Victoria them wrap around to the Doctoria zone then down to Icicle crk.